Egyptian President Abdel-Fattah El-Sisi told South Sudanese President Salva Kiir in a phone call that Egypt supports the peace deal that has been signed between the government and rebel factions in South Sudan, a statement by El-Sisi's spokesman Bassam Rady read. In early September, President Kiir signed a peace agreement with rebel factions in the Ethiopian capital after a five-year civil war that killed at least 50,000 people and displaced two million. El-Sisi said that Egypt supports efforts that achieve stability and development and meet the aspirations of the South Sudanese people. El-Sisi also stressed Egypt's keenness to strengthen bilateral cooperation and provide technical support to South Sudan. 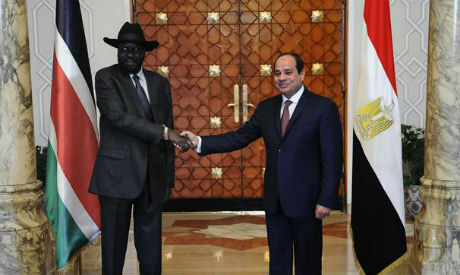 Kiir hailed Egypt’s role in supporting stability and development in South Sudan. The last meeting between the two leaders was in early September on the sidelines of the Forum on China-Africa Cooperation (FOCAC) 2018.